This post serves two purposes. One, of course, is to tell you what I personally think you should pack in your hospital bag. And for all of you not needing to know about what to pack in a hospital bag then... Two, is to tell you about a website called Groopdealz. Groopdealz is an awesome online shop that allows you to purchase many everyday items for an extremely reasonable price. You can find anything from women's fashion, to home decor, to stuff for kids! The items available change everyday so you always have something new to choose from. The black top I am wearing here is one that has been worn on repeat since I purchased it from Groopdealz. I actually packed it, along with a gray cardigan I got from there, in my hospital bag. While I was on Groopdealz I also picked up a sweet little hat for JT. Like I said, one stop shop for all the things you might want at a price that doesn't make you feel guilty for buying it. Let me start by saying I have never had so much anxiety about packing as I did when it came time to pack for the hospital. I read the blogs, asked my mom friends, even took a class at the hospital where they suggested what to bring. But every time I went to pack, I still got so overwhelmed. Truth is...I overpacked. Like. Big time. And I don't want you to do that. Because busting through the hospital doors with a bag for yourself, your husband, and your baby is just a look I want you to avoid altogether. You don't need as much as you think, but there are some very valuable things you will need. What I packed: Several pairs of pajamas, a robe, a coming home outfit for myself, and cute outfits to put on when we had visitors. My Mistake: Uh. FORGET the cute outfits. You will not have the energy or the desire to "put on something decent". Stick to whatever you are comfortable sitting, nursing, sleeping in. Your visitors don't care what you look like. All they care about is seeing your child. I also didn't wear home my coming home outfit. In fact, I just threw on the dress I walked into the hospital with when we came to deliver her. My coming home look was at the bottom of my bag and I honestly didn't feel like getting it out. 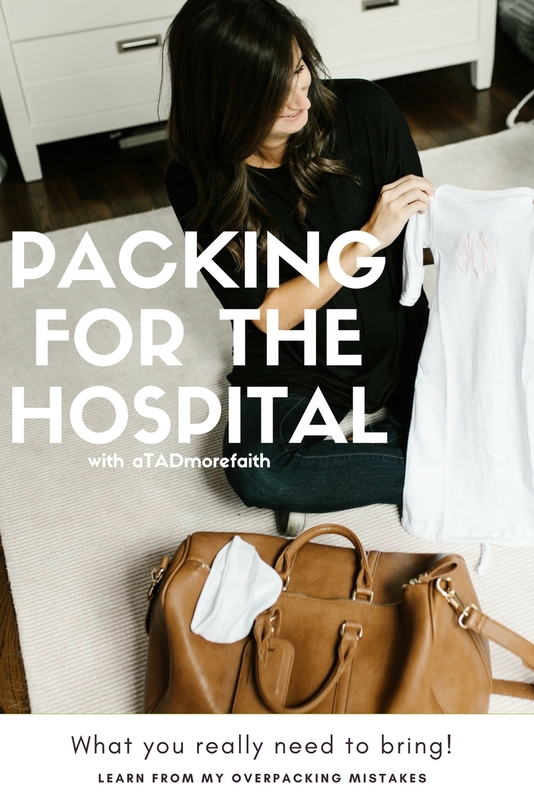 What you should pack: Pajamas, a robe, something to walk in and out of the hospital with. I also recommend that if you are planning to breast feed your pajamas be spagetthi strap. Something you can easily pull down to nurse. I had people coming in left and right trying to help me get my girl to eat. And when your brand new baby is wailing for food you need to be able to move fast! What I packed: face wash, moisturizer, shampoo, conditioner, volumizing mousse, curling iron, hairdryer, make-up, toothbrush, basically everything I would need as if I was headed to a fancy restaurant. Mistake: I never threw on any makeup. I never curled my hair, in fact I didn't even blow dry it. You are so tired. Your body is tired. You don't need a glam squad in the hospital. What you should pack: Pack whatever you need to feel good about yourself. I felt like a whole new person after I was allowed to take a shower and just wash my hair. If it will make you feel better to blow-dry and fix your hair, then do that. I did not have the energy or the time. Thankfully the good Lord was looking out for me and let my hair air-dry so nicely that day. It hasn't happened since so I realize He isn't making this a thing. What I packed: Coming home outfit, an extra onesie, two swaddles, a boppy, a blanket, socks, hat, mittens and her carseat. Mistake: I didn't need half of the stuff I packed for her. What you need: You need an outfit to bring home your baby. That is the ONLY outfit you will need. The hospital will provide you with onesies, swaddles, and hats while you are there. You need a boppy, especially if you are planning on breastfeeding. Carseat - hopefully thats a given. I do recommend brining mittens. Their little nails grow fast and the mittens help keep the baby from cutting their own face. You will need a blanket depending on the weather. If you plan to breastfeed, I highly recommend going ahead and buying some nursing bras. I bought a couple from ASOS to have in the hospital and for those first several weeks at home. Now, that I have gotten the hang of it, I don't feel like I have to wear a nursing bra all the time. So I wear bras from Yummie by Heather Thompson because they do not have the underwire and are much more comfortable. I hope learning from my mistakes will help you in your packing needs for the hospital. If you want to shop any of my suggestions just scroll through the links below. To be totally honest, once you get that brand new sweet baby in your arms you won't really care about anything else. Especially your overpacked hospital bag. This post was sponsored by Groopdealz. Opinions are my own. All products were selected by me. Thankful for partnerships like these that make a TAD more faith possible.